Grandma Shreibak may have taken her sweet time parting from this world—91 years to be exact—but she still managed to leave behind one piece of unfinished business. She never bothered to reveal the alchemy behind her Sweet Spaghetti, a tangerine-hued, curiously cloying mainstay of our family gatherings, the sole semblance of culinary tradition in the Shreibak bloodline. What began as Grandma’s thrifty 45-minute dinner solution eventually flourished into a family-wide obsession. Pry open a refrigerator door in a Shreibak kitchen and find a foil-sheathed casserole dish bogarting half a refrigerator shelf? You can bet your life that underneath lies a pound of Sweet Spaghetti bruised with the late-night swipes of a fork. True zealots even keep a frozen batch on hand as well for ragtag celebrations, unexpected visitors, and whatever heartache needed to be soothed by a stomachful of pasta. When Grandma left, so too had the honest-to-goodness recipe for Sweet Spaghetti. The only culinary blueprints left behind were gnarled scraps of paper—some typed, others scribbled, all cloaked by a patina of grease and perfume. Units of measurement were invented (“a good handful,” “a stiff shake”) and any notion of cookings standards was comically disregarded (“use whatever dish is around,” “crank the oven to 400 and a hair less”). No one in the family could seem to properly translate “brown sugar to taste” from paper to practice. It took me three trials with a food processor older than I am to mince the vegetables into their rightfully minuscule cubes. Mimicking the legendary sauce was like conducting a half-wit Pantone summit, leading to feuds over the nuances differentiating maroon from brick red and terra cotta from orange. A year or so after Grandma died, the Shreibak women left behind resolved to decode her culinary legacy, to cook toward closure. 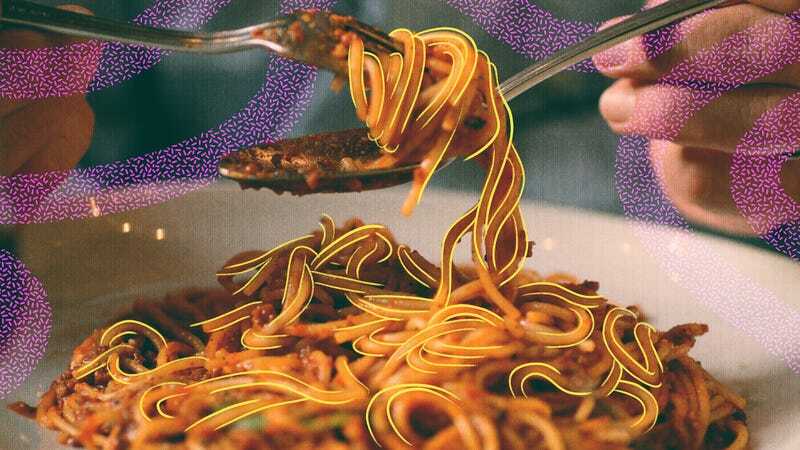 Pounds of spaghetti and many months later, when all hopes seemed to be dashed and we could barely glance at a sapphire blue box of De Cecco spaghetti without shuddering, it finally happened. “It’s the soup,” my Aunt Mimi bellowed as she doled out ladlefuls of pasta onto our plates one Christmas. Aunt Mimi was a legend within the family before, but this moment of gastro-glory cemented her status as a downright demigod. She managed to hit the bedrock of Sweet Spaghetti: A family-sized can of Campbell’s Tomato Soup. As opposed to its single-serve counterpart, the oversized can boasts a toothsomely mellow, almost honeyed formula that serves as the perfect foil to the brininess of the sauce’s bacon and the undercover earthiness of the blitzed vegetables. As we all dug through the heaps of noodles piled high on white-and-gold china, we shared our favorite stories of the woman that made us go to all this trouble. Grandma Shreibak was a blaze of bottle-dyed black hair and art deco rings and velvet dresses, a lady who would pregame a night out on the town by eating Schwan’s ice cream cups with her grandkids. She never failed to make everything in life, including spaghetti, a little sweeter. Brown bacon in large pot. Add onion and peppers and sauté until tender. Add can of tomato soup (no milk or water) and stir. Add brown sugar to taste. Mix sauce with cooked spaghetti and place in a covered dish. Bake for 45 minutes and serve.